Gabe made his debut for Llanelli aged 17 and after a spell in London when studying as a teacher, he joined Cardiff where he excelled as a centre in partnership with Gwyn Nicholls. 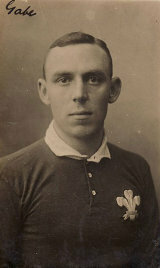 In eight seasons, including one as captain, he was at the forefront of the game and between 1901 and 1908 he also played 24 times for Wales, captaining them once. In 1905 he was a member of the side which beat New Zealand and the previous summer he was in the British Lions team which won three of the four Tests in Australia. He retired in 1908 but still made occasional outings for his club. He was also an excellent golfer and a good enough cricketer to play for Glamorgan in the era before they were a first-class county.